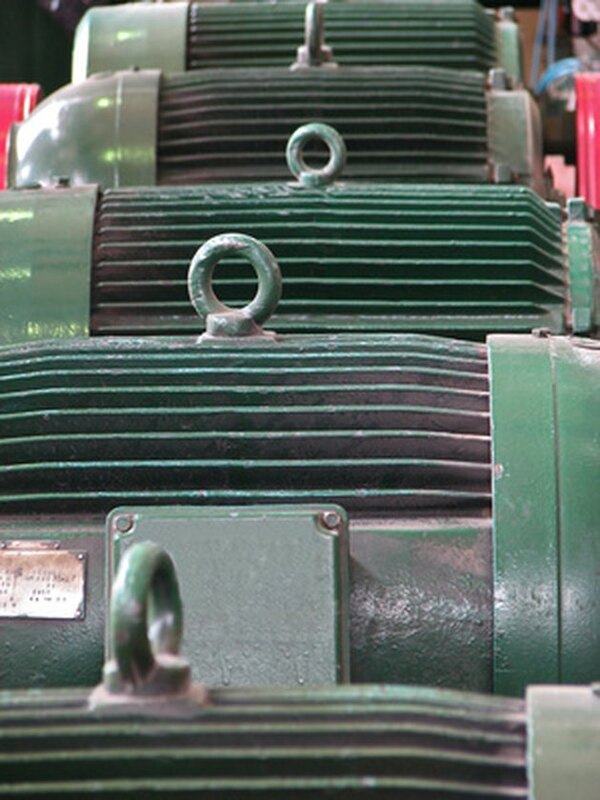 Single-phase motors are used to power everything from fans to shop tools to air conditioners. Residential power is usually in the form of 110 to 120 volts or 220 to 240 volts. Wiring a motor for 230 volts is the same as wiring for 220 or 240 volts. Some motors allow both 120-volt and 240-volt wiring by providing a combination of wires for doing so. Be sure you have selected the correct wiring configuration before you begin wiring. Electric single-phase motors have many uses. Read the nameplate on the motor and confirm that it is a dual-voltage motor. It will specify two voltages, one high and one low. The high voltage will be 200 volts or more; the low voltage will be 125 volts or less. Open the wiring box cover by removing the screws and verify there are four wires inside the box for wiring the motor. Look at the underside of the cover for the wiring diagram, which specifies which wires are used to wire the motor for 240 volts. The wiring diagram will show that two of the motor wires are connected together for 240-volt wiring. Connect the ground wire from the switch to the ground terminal in the wiring box. The ground terminal should be a green screw, or possibly a green wire. Strip the wire ends with a wire stripper and fasten them together with a wire nut. For a ground terminal connection, loosen the green ground screw and wrap the green ground wire around it. Tighten the green ground screw firmly. Connect the two wires in the wiring box together as specified by the wiring diagram for a 240-volt connection. Strip the ends of the wires if necessary and twist a wire nut onto the pair of wires. Connect the two hot wires coming from the switch to the remaining two motor wires with wire nuts. Strip the ends of the wires and connect one incoming wire to one motor wire. Repeat the process for the second incoming wire and motor wire. Read the motor nameplate and confirm it is a single-voltage motor rated at more than 200 volts. Open the motor wiring box by removing the screws and examine the wires. You should see two black wires and either a green wire or a green grounding terminal. Look under the wire box cover for the wiring diagram. Both wires on the diagram should be labeled "Load." Connect the incoming ground wire to the ground terminal or ground wire. Strip both wires and connect them together with a wire nut. Or loosen the green ground screw, wrap the green ground wire around it, and tighten the screw. Connect the two incoming hot wires from the switch, one to each motor "Load" wire. Strip the wires and connect them with wire nuts.